Tax Free Weekend Texas 2016 coming soon for Back to School. Great news for the people of the great state of Texas. 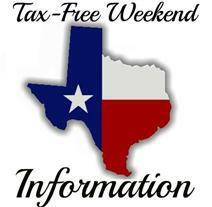 The Texas Comptroller of Public Accounts announced that on Friday through Sunday, August 5th – 7th, 2016, there will be a Tax Free Weekend Texas 2016. Full details below. Lists of apparel and school supplies that may be purchased tax-free can be found here. Shoppers are expected to save an estimated $92 million in state and local sales taxes during the sales tax holiday. The Texas Tax Free Weekend has been an annual event since 1999. Select going on our Facebook event to be notified in advance before the holiday.